The following is a condensation of an article prepared by Captain Paul Lane Ives, Pilots' Association and a founding member of the Committee, and CDR Peter Randall, USCG Philadelphia, that appeared in the "USCG Marine Safety Council Proceedings" October 1997. On the last day of August, 1964, a small group of pilots, the marine superintendent of a fleet of bulk carriers, and the local manager of a steamship operator/agency met in the office of the president of the Pilots' Association for the Bay & River Delaware in Philadelphia. The meeting lasted most of the day, the mariners determined to solve some of the vexing problems associated with the transit of large, deep draft iron ore vessels through the Delaware Bay and River to near the head of navigation at Morrisville, Pennsylvania. The pilots, entrusted by law and tradition with ensuring the safety of their vessels, were beginning to feel they might be reaching the upper limits of safe navigation given the condition of the channel, the uncertainties of the weather, and available technology of the day. On the other hand, the vitality of industry in the three state Delaware Valley depended more and more on the economies generated by larger cargoes and deeper drafts. It was in this cooperative spirit and a mutual desire for both efficiency and safety that it was agreed to form the Navigation Committee for the Delaware Bay & River. The stated purpose of the Committee was: "... to primarily concern itself with the safety of navigation with particular regard to large ocean going vessels. In this regard, it will recommend safe drafts on the basis of experience in navigation and in the light of current channel information as published by competent authorities". The Articles of Organization go on to state that "the Committee shall make specific recommendations: To the local US Corps of Engineers with regard to extent, details, and frequency of hydrographic surveys of the navigable channels. To the local US Coast Guard, with regard to number, location, type, and characteristics of navigation aids. To existing committees in the area with regard to improvements which would be beneficial to navigation. To bridge authorities with regard to co-ordination between opening of bridges and river traffic. To channel users in general with regard to channel characteristics and limitations as they may affect safe navigation of vessels". This was a unique group from the very beginning. It was quickly decided that membership should be limited to master mariners, local pilots, and representatives, ex officio, of the U.S. Coast Guard and U.S. Army Corps of Engineers. The participants would bring extensive knowledge and experience to the table, and they were empowered to make decisions for their principals. The committee would have no specific authority, but voluntary compliance with their recommendations was almost assured because of the wide scope and support of the membership. The first formal meeting was held on 26 October 1964. The agenda included several items including an agreement that all increases in draft should continue to be made in six inch increments, following a period of experience and review with the previous draft. A ship owner brought up his concern with navigating the upper river in marginal weather conditions. The Committee unanimously agreed that: " where, after proper consideration of the situation, the pilot considers it unsafe to proceed, the vessel should remain alongside the pier or proceed to an anchorage". It was further agreed to circularize the marine industry and seek broader representation on the Committee. Within a very few months, representatives of most of the major oil tanker owners and operators had joined the deliberations. It is interesting to look at the backdrop against which all of this took place. In 1964, most of the major oil companies operated their own fleets of American Flag tankers supported by extensive marine departments. The average ship was in the 32 to 50 thousand ton class, while chartered foreign flag crude carriers were approaching 70 to 80 thousand tons. United States Steel had recently constructed a modern steel mill at Morrisville and was transporting iron ore from Venezuela in a large fleet of 50 to 70 thousand ton vessels. It was the development of this bulk trade in the upper river and the completion of the new 40 foot channel above Philadelphia that occupied the attention of the early Committee. As membership expanded to include oil company captains and marine superintendents, a whole new aspect of the Committee developed. It was suggested that the morning part of the meetings be devoted to problems of the lower river and bay, and afternoon sessions concern themselves exclusively with the upper river. Meetings were held quarterly, more often when needed. The recommendations of this Committee became the standard of due care and preventative action in the local maritime community. As vessel size continued to increase and complex new risks and safety issues were addressed, the finest talent in the maritime industry tackled these problems and guided the growth in a safe and efficient manner. Recommendations to the Corps of Engineers included clearing the 40 foot project channel to its full dimensions with over dredging where practical, and enlarging the anchorages. To the Coast Guard: new and brighter aids to navigation and ice resistant buoys and structures. To the owners and operators: maximum draft guidelines, real time tide management, maximum size vessels for certain anchorages, use of stand- by tugs under certain conditions, and a host of other practical operational issues. Public members of the Committee appreciated the opportunity to air their concerns and get some really good advice on local matters, a few of which ultimately found their way into the federal regulations. For the most part, regulation was never a goal. Members of the Committee voluntarily complied with their own recommendations and no operator would even think of doing otherwise. In periods of heavy winter ice, when floating aids were often off station or missing, the Committee willingly imposed draft reduction as an additional safety measure, in spite of the heavy cost of lightering. A Captain of the Port Order was never necessary. An excellent modern day example of the committee's problem solving know how is demonstrated by its work on the Delaware Bay sealanes and approaches. As ships and tows became larger and deeper, there was an increase of incidents at the entrance to the Delaware Bay. Foreign shipmasters, unfamiliar with the waters, were sometimes confused by the dog-leg approach to the pilot boarding area. At the same time, tugs and large barges were crossing the precautionary area in increasing numbers to get into the deeper water of the sealanes. An early 1990's collision between an inbound ship and outbound tug and barge focused the committee's attention on the problem. A working group consisting of a shipmaster, a pilot, and a tug captain began the task that included several trips between Philadelphia and New York on tugs and ships. Through the experience and cooperation of the members of the committee, a plan was devised and implemented. NOAA sent in a survey vessel to update the hydrography of the area. The USCG Fifth District Aids to Navigation group established several new buoys creating a secondary, deep water channel for the use of tugs and barges. They also repositioned several entrance buoys and began the International process through IMO to realign the sealanes. This was finally completed in 2001. As a result of OPA 90, the federal government has been establishing similar committees in ports around the country with mixed results. Over the years, the Mariners Advisory Committee has remained faithful to its charter, changing only its name to more accurately reflect its present day role. 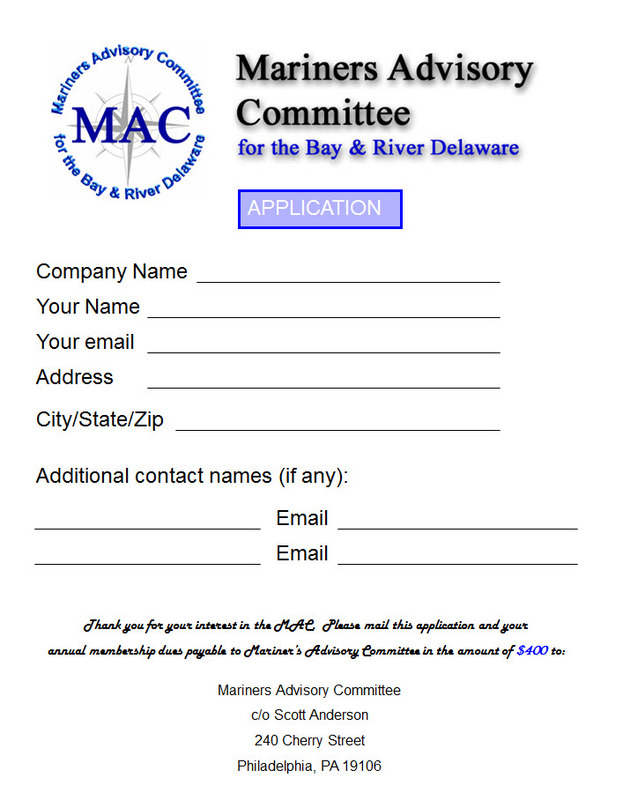 Its membership and direction have remained within the local port maritime community, its chairman has always been a Delaware Bay and River Pilot.